MX-5 Scotland • View topic - Aloha! As of Saturday just gone, I'm the proud owner of a Mk1 1.6 Monza in BRG, she needs a bit of TLC but crucially is almost entirely rust free as far as I can see, actually looks like she's been sat in a shed for a few years. It's my dream car and I plan to keep this and get it back to full health, with no (well, few) expenses spared. As I said to my friend, I want to be sitting on my porch when I'm 70 with this in my garage in immaculate condition. - Will probably need a new hood at some point, might as well get a Mohair Mk2 one fitted with the tasty heated glass! After all that, it'll be onto a chassis / panel de-rust and weatherproofing crusade. Will eventually do some smartening up of the inside as well, footwell / puddle lights and stuff, some nice iPod integration etc., just creature comforts. I'll *maybe* get a PAS rack and bits, but non-PAS is starting to grow on me, feels like a go-kart and is actually quite fun! Might also look into retro-fitting ABS, but it looks heck of an expensive with all the parts that need found / replaced... We'll see. Anyway, nice to meet you all, look forward to popping along to meets and stuff to say hi! nice car good luck with it, my Mk 1 has no power steering and i love it, i like the way you hang on to the steering wheel in the corners. Cheers Gav, had it out for a short run today and the steering just keeps growing on me. Should probably have said for anyone wondering, my name is Al, as in the song. 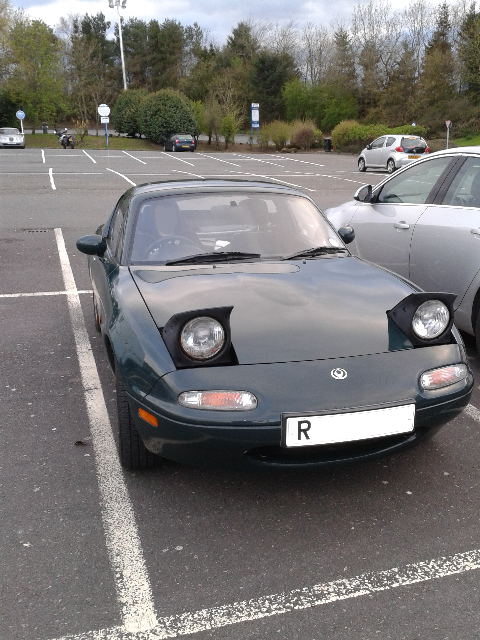 Welcome to the good ship MX-5 Scotland fella. I am another newbie from Arbroath. Nice car welcome to the forum. Why not bring it along to Pitlochry at the weekend and join in the fun. Hope you make it to Pitlochry at the weekend, to meet up with a whole heap of like minded souls. Thanks again Ian for sorting out the site registration, and thanks to all for the warm welcome. I hadn't realised the Spring Rally was this weekend, I'm off house hunting... Will get the next meet in the calendar so I don't miss it! Hope you all have a great time in Pitlochry, the bungee jumping is excellent by the way. Hi Al and welcome to the site, sorry to hear that you will miss the rally and hope house hunting goes well. Keep an eye on the forum for future events and runs, hope to see you on some. Hopefully catch up with you at a Grampian event before too long.